ROAD TOWN, Tortola, VI - At a time when incidents of gun-related crimes have spiked, along with a number of motor scooter riders either losing their lives or injuring themselves in accidents, Mr Henderson K. Tittle, President of Mentoring Anointed Leaders Everywhere (M.A.L.E. ), in collaboration with newly formed local scooter and motorcycle riding group, ‘284 Reverz’, hosted an event dubbed ‘A Ride for Life’. The initiative held on Saturday, March 25, 2018, also came on the heels of one of the members of M.A.L.E. breaking his legs in an accident in February 2018. Over 50 riders gathered at Port Purcell’s roundabout and made their way into Road Town and continued to Prospect Reef before culminating in the parking lot of Sunny Caribbee in Road Town, where a short ceremony took place, addressing topics of safety while riding and bike regulations. Among the speakers at the ceremony was Mr McKenzie L. Baltimore Sr., Vice President of M.A.L.E., who expressed that the aim of the initiative is to “send a strong message” to riders to let them know how important it is for them to wear protective gears while they are riding. During and after the ceremony, persons were able to register their bicycles for $10 which lasts for a year and also scooter and motorcycle riders were able to renew or get a new license done on the spot. 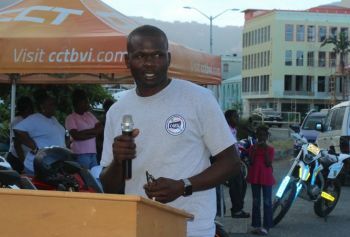 Meanwhile, Director of Department of Motor Vehicles (DMV), Kye M. Rymer said his department took part in the ‘A Ride for Life’ initiative because they thought it was “important”, reiterating that road safety is very important for a rider because it can save individuals during an accident. “We wanted to be here because we thought it was a very important initiative. I think that everybody’s lives are important and I need to reiterate road safety. I am an avid rider and I would encourage anybody else to pull on your helmet. That simple helmet can actually save your life from a collision or save you from any sort of head injuries and so forth. It’s not just the law but it also protects you when you are out there riding,” emphasised Mr Rymer. Kennedy D. J. Emmanuel, President of 284 Reverz, pointed out during the ceremony that the safety of motorcycle riding should be “top priority”, adding that riding a motorcycle is different from driving a car. In addition, Mr Emmanuel listed a few safety tips, such as checking tires and oil, test front and rear brakes, test the horn and always wear protective gears like a helmet, reflective jackets, and boots. “Be aware, alert and ride sober,” he said. Commissioner of Police (CoP), Michael B. Matthews, urged persons to “educate and encourage” young people rather than “criminalising” them, while emphasising that the job of the police is not to cease persons bike but to ensure that they stay safe while riding on the road. “Let’s us not criminalise the young people. Let’s us try to educate and encourage young people and today is a really powerful message. Some men were frightened to come along today because they thought the police were going to trap them and take their bikes. This isn’t about taking your bikes away. This is about making you safe on your bikes. To the young people that didn’t come today, whatever your reason was you have nothing to fear from the police. My job is not to start ceasing bikes. I don’t want to stop you from having fun. I do not want to take your livelihood away. I want you to be safe. I want you to be legal,” while adding that this event should be the first of many more to come. Joseph A. Chapman, father of Jo-vahn A. Chapman who died in a motorcycle accident, expressed that his son lost his life at the age of 17 years in a motorcycle accident in December 31, 2013, while indicating that he was unaware that his son rode a scooter as he did not approve of him riding one. @cay 110% agreed with you. I love how they give the youths a chance to do a cone test and if pass (give them a license one time. Many others was too shy as they thought it was a trip for the police to get them. I’m happy that we now have 5 registered bikers in our community. Let’s encourage the youths and the adults to keep this movement going. planted years ago has finally borne fruit. ...to God be the glory. Seems like its more locals than island men? After all I man born yah.. Nah!! They were all Island men born on an Island like Tortola. Follow or Get out the darn way. excellent initiative. Can you please get members not to weave in traffic, pass on a curve, tailgate, or rev motors for loud mufflers. It is all dangerous and disturbing the peace.